Stephanie 5 is the latest generation of the hugely popular petite hometown girl for every day. 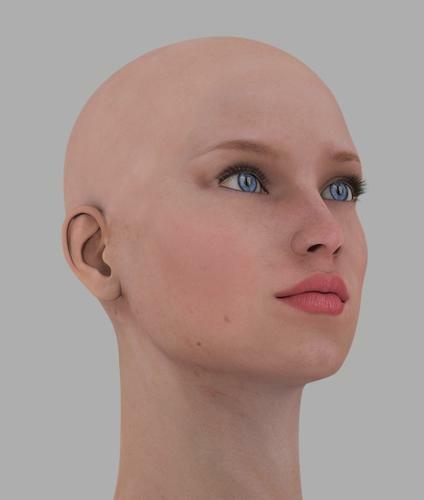 Based on scan data of a live model, Stephanie 5 represents the next step forward in realism from DAZ. Stephanie 5 includes several shapes, poses, and features that will give you the ability to customize her to your liking and show off her beauty. Because Stephanie 5 is built on Genesis you can mix and match her shapes with each other and with countless other Genesis shapes to create an exponential number of face and body shapes and styles. Stephanie 5 Fully Utilizes the Power of Genesis to add to your collection of the most versatile figure platform ever created. SAVE 51%* During the Intro sale. Buy the Stephanie Pro Bundle and get two additional dress textures Free for a limited time. Feel Free to share your favorite Stephanie 5 renders here! So... any hint on how long the IntroSale will last? From Product-Site: Purchase this item on or before August 22, 2012 and get 100% off the Summer Casuals Fitted Sundress Textures 1 and Summer Casuals Fitted Sundress Textures 2. All 3 items must be purchased in the same cart transaction. According to my calendar we have today August 21. 2012. This is indeed a very limited time ... just one day and the main page of the shop don't work. How should we know that? I wish you would extend the sale and the limited offer 'til September. Would like to know if Stephanie has a whole new UV set like V5 did... Because I rather like Riley texture but I'm currently unimpressed with Stephanie and the base stephanie texture... would be a bit of a bummer to have to buy stephanie just for riley. I'm sure there will be more lately but only Riley interests me now. Then again i suppose that's a good thing, because as they say, 'I'm all tapped out' and couldn't buy it this month anyway, then the sale will be over, then it'll be the PA sale and immediately after the PC sale... DOOMED. Man! Too much awesome stuff has come out in the last week, and me with no cash! I wish the sale was a bit longer, too... but I am sooooo glad to see her here! Can't wait to see all the new renders! Judging by previous performance this year (m5, supersuit), it's likely to be on sale during the PC sale even cheaper. and get two additional dress textures Free for a limited time. This doesn't seem to be working. I have The Bundle in my cart along with the textures, but the textures remain $4 and change. Nevermind. I just realized what the wonky shopping cart was doing. God, this place could make breathing seem complicated. thought it was a great buy anyway but could have been even better! too much hassle to fix, got enough to download already anyway with my crap broadband! Um... that's the way it's always been... The intro sale may be higher than future sales, but that's what you pay for: to get it first. Really, Daz has always discounted something by 65% within 3 months of launch? Well... at Wal*Mart... 3 months is just about the exact time to put things on clearence... since it indicates the start of a new season. Swimsuit cost in May: $25-$100. Swimsuit cost in August: $10-$30. On the Stephanie 5 product page, under what's inlcuded and features, it says 'Stephanie 5 Custom UV Set', so yes. What I'd like to know is if the genetalia that come with the S5 Pro pack also have e.g. S5 UVs, presets and custom morphs, and if so will the genetalia from buying the V5 Pro pack be updated to include those too. This looks great; I have know what I'm buying when I get home. Too bad I volunteered to work over a few hours this evening. Oh well, I probably should do more overtime, as long as DAZ keeps putting out products I like. By the way, does anyone know what bikini S5 is wearing in the above pic and on the product page? It would be good for some renders I have in mind. Thanks. I looked at the product page and it does appear to be the one. Genesis is the new Free figure from DAZ3D. :) (Just like V4, when she was new and included in DazStudio) I don't think any of the other figures ever debuted free, did they? Actually, Victoria 4, Michael 4 and Hiro 4 are all showing as $0.00 orders in my history. I kind of miss the free basic morph (edit: I'd say "and figures" but... Genesis is free anyway), but I do think it's an unsustainable way of working compared to the work that went into it. True that they are all $0.00 now but when they were released AFAIR they weren't free which is the point I believe Jasmine is trying to make. And, as you say Genesis - which is the real base - is free. Yes. Exactly. Sorry if I wasn't clear. I was asking if any other figure ever launched for free. I don't believe they did. I wasn't around for Gen 3, but I do recall all of the the Gen 4 figures had a tidy little price tag when they were new. I THINK, not sure, I got some of the Gen4 people for free on launch. I always bought the ProPacks, so I was spending money, but I always picked up the free ones when they came out. LOL! You asked if Wal-Mart put new stuff on the clearance rack. That was hilarious. I needed a good laugh the way my day was going. Texture test - Uberlighting (Occlusion Samples 256, Shading Rate 8, Max Error .1, Max Trace 20), default textures that come with Stephanie 5... Used "Look at me!" eyes though. Yeah.... She's a keeper. Love the poses that come with her! as usual I cannot download the poses (could not for M5 either) will have to reset and try later, for some reason those always give me issues with my crap broadband.